To say there’s a lot of history behind the F-150 would be an understatement, the F-150 is practically an American icon. Major updates to the F-150, which is already the bestseller in a top market segment, represent a pretty hefty gamble on Ford’s part. The F-150 is the workin’ man’s truck and if there is one thing the workin’ man favors it’s the tried-and-true. The F-150 Ecoboost is a little different. With high-tech features like twin turbochargers, direct injection, and a focus on fuel efficiency the 2011 F-150 Ecoboost might initially scare the die-hard truck men among us. It all sounds a little tofu and yoga-ish at first, then you turn the key and any ideas about tofu fly out the window. If there’s one thing us truck lovers love, even more than what’s tried and true, it’s horsepower and torque. Remember that tofu and yoga part? This is where it flies out the window. 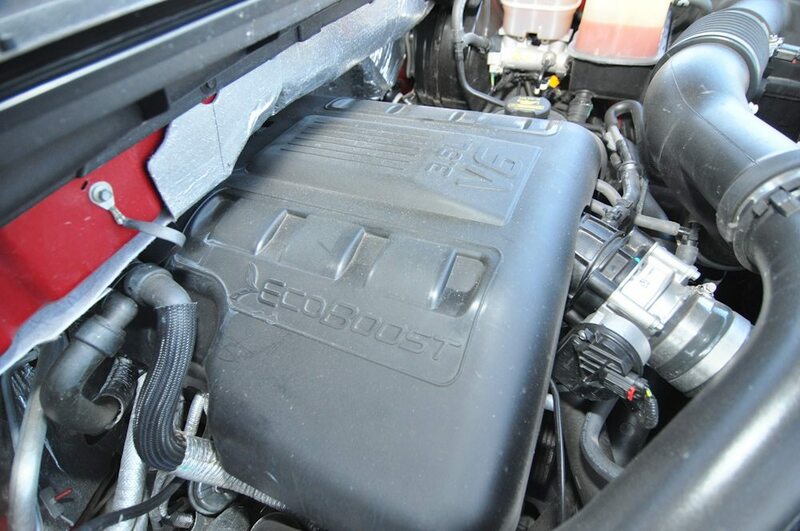 Yes the Ecoboost engine has Eco in the name and yes that means it sips gas. But the EcoBoost sips on gas and whips up a very satisfying 365 hp paired with 420 lb-ft of torque. Forget about your Eco, tree hugging worries about this being a Prius with a bed, this is a truck. The Ecoboost engine is one of four new F-150 power options for 2011, other options include: a 302-hp, 3.7-liter V-6 which is standard; and a 5.0- and 6.2-liter V-8s producing 360 and 411 hp respectivelly. Oh, and that 6.2-liter “Boss” V-8 is reserved for special F-150s, like the SVT Raptor, so the EcoBoost V-6 is top-of-the-line for most F-150s. 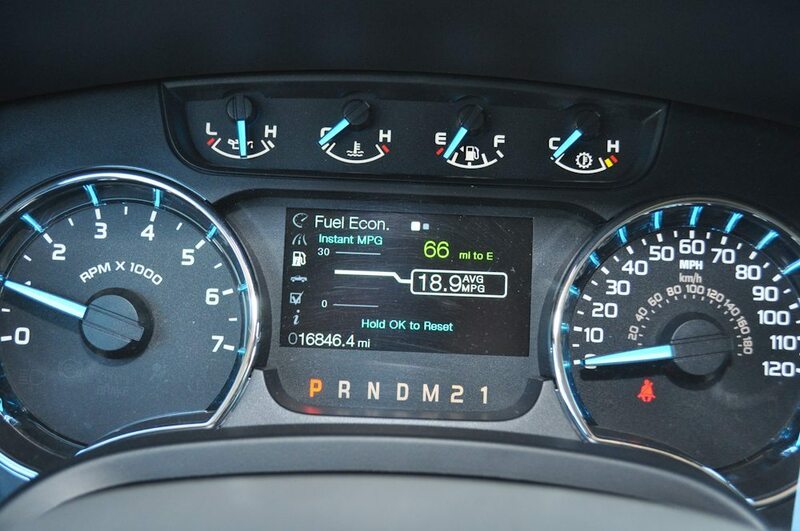 The EcoBoost power option comes in at a cost of $1750 more than the 3.7-liter V-6 and $750 more than the 5.0-liter V-8. The Ecoboost engine is the first turbocharged V-6 in a full-size pickup and comes mated solely to Ford’s updated 6R80 six-speed automatic transmission with manumatic shifting. A slight disappointment is the rather flat exhaust note that comes out of the truck, though it is fitting and will help appeal to the traditionalist. The sound, however, does make it easy to mistake the EcoBoost V-6 for V-8. I drove the F-150 Ecoboost for 10 days. I put it through everything from everyday city driving to mountain highway passes and the EcoBoost felt noticeably strong the whole time and it never seemed to run out of breath in the thin mountain air. The turbos spool up incredibly quickly and put out only a slight whistle to let you know their there when you put the truck under load. Acceleration in the Ecoboost is a truly awesome thing. It’s relentless, the truck has more than enough reserve power for passing, even when you’re already traveling at 80mph on I-70’s 6% uphill grade. The Ecoboost is also a capable puller, capable of towing 11,300 pounds and it can carry a whopping 3060 in the bed. You get electrically assisted power steering for 2011, it’s more efficient than a hydraulic and makes low-speed maneuvers a breeze. The only downside being that the feel is a bit dull. The 2011 truck’s interior is similar to 2010’s. The addition of a 4.2-inch information screen in the gauge cluster is a handy feature. The screen displays the trip computer and other scrollable functions including; fuel economy information, vehicle settings, trailer-towing details and on off-road inclination indicator. The system is actually laid out quite nicely and navigating the features was very easy and quite intuitive. Plus it plays a little “Built Ford Tough” video when you start the truck. Seating was comfortable and my passengers loved the copious amounts of leg room in the crew cab. Other niceties included Sirius satellite radio, the useful and capable Sync system, and a nice reverse camera in the rear-view mirror. As you can see I averaged 18.9 MPG during my 10 days with the truck. Pretty incredible really, especially considering I drove it in a manner more conducive to testing power than economy. City driving was pretty acurately around the 16 MPG range touted by Ford and highway miles came in right around the 22 MPG mark. The Ecoboost really would make a great work truck. Having driven F-150’s for jobs in the past I know how often you find yourself pulling up to the pump and with gas prices edging towards $4 every bit the Ecoboost saves you counts. It’s hard to see the Ford F-150 Ecoboost go. Ford’s found a fine nirvana in truck making, you get all the power you could want from a capable truck and save gas while you’re at it. A win, win situation no matter how you look at it. The F-150 platform is a great platform and the Ecoboost power option complements it perfectly to create a great all around truck. If you’re in the market I wouldn’t hesitate to give the EcoBoost a good long look. A basic Ecoboost prices out at $25,440 regular-cab XL with rear-wheel drive and an eight-foot bed; the top-of-the-line four-wheel-drive Platinum SuperCrew with a 6.5-foot bed starts at $48,770.